Loved this early AM access and tour guide was great. I absolutely loved everything about this tour, especially the guide Mahesh, and the driver KK. Mahesh is so knowledgeable about India’s history, and KK, one of the best drivers we’ve had in the country. We had great conversations with both of them, whom are so friendly and respectful. Just AMAZING! This tour overall was really good, my guide Vinnet Goyal was fantastic. He was very knowledgeable and funny, we had a great time together visiting the Taj and Agra Fort. I would recommend him as a guide to any family or friends. My only comment would be about our trip to the marble carving company, where I was able to see how the marble and precious stones are carved. This is a cool portion of the tour and would recommend seeing the process. Their finished products are very beautiful. However, the prices I encountered were 300-500 above what they should have been. I understand that this is common and I wasn't forced to make any purchases whatsoever, but coming from someone that travels very often I didn't appreciate it. If I were on a time constraint it would have bothered me as it can hinder your ability to see another sight in Agra. This is not a complaint but more of a recommendation to others hoping to make the same trip. As previous mentioned, Vineet Goyal was a great guide and I would highly recommend him if you hope to see the Taj and Agra Fort. 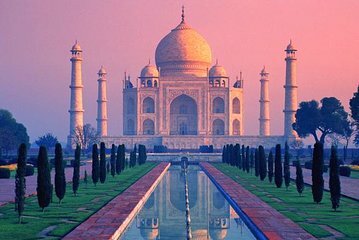 I have been traveling for business in India only had a weekend to explore Agra and Delhi, given that I wanted to get the most out of my time I decided to take the train into Agra Friday night and I booked the 'Sunrise Taj Mahal and Agra city tour' through Pacific Classic Tours India. I am so glad that I did! Our guide, Rishi Pal, was incredible, he was waiting on time for us at 6 am ready to walk us to the Taj from our hotel and fill our heads with more knowledge than you would think one person could possibly contain, a trend that never ceased through the whole day. Rishi kept us laughing all morning and helped us get all the photos necessary to keep our family and friends jealous back home. He always seemed to find beautiful and quiet spots to walk us through the history of each of the monuments we visited during the day, despite the nearly overwhelming weekend crowds. Speaking of crowds Rishi knew all of the routes through each monument ensuring the least traffic and with him long queues seemed to just disappear. The shopping portion of the day was accompanied by a few persistent vendors and admittedly I did make a few purchases but I do not regret any of them. I really appreciated getting to see how these fine crafts were produced. And it was fun haggling the prices! We had an earlier train to catch on our way back to Delhi that we were a little nervous about but Rishi made sure we didn't have to stress about it a single moment, he even squeezed the sunset from the Moonlight Gardens which we though we would have to skip. At the end of the day he accompanied us right to the train car to ensure a smooth departure. If you only have short period of time to get the most from Agra I would absolutely recommend taking this tour, you will not be disappointed! Our guide, Mr. Mahesh, was superb. There was not a single questions he couldn't answer for us and he spoke very good English. Our driver for the day, Bipin, was also the best driver we had during our entire trip to India. I highly recommend this tour. Our guide was very flexible and asked us before we did anything if we needed a break, more water, or wanted to skip something we weren't particularly interested in. He also gave us plenty of time at each stop to explore the grounds ourselves. The guide and driver were both always on time, courteous, and knowledgable. The only thing that could have made this better was cooler weather! Mahesh was an amazing tour guide - he has an endless wealth of knowledge and goes above and beyond to ensure you're enjoying the tour. He is also an amazing photographer - my travel buddy and I have the best pictures and it's all thanks to Mahesh! Incredible tour - not a single complaint. It was really a nice experience. Our tour guide Mr. Mahesh made us feel very comfortable. He was very informative and we felt like we went back into history. We learnt many new and amazing facts in this tours. Especially Taj mahal, Agra fort and marble art factory was very mesmerizing. The visit was exceptional and worth every minute, I spent. The guide, Mahesh, was very well prepaired and could answer all my questions regarding Indian and related history. It was an absolute, incredibly good experience. Hugely knowledgeable guide, great timings to fit a lot in a day, highly recommend this tour.